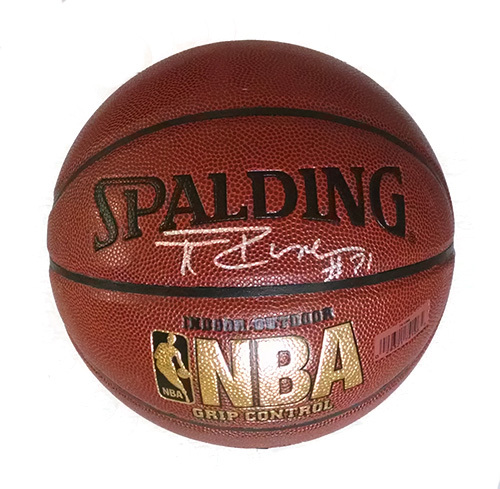 A Spalding NBA basketball signed by Tim Duncan of the San Antonio Spurs. Comes with a Certificate of Authenticity. Tim Duncan is a Virgin Islander American professional basketball player for the San Antonio Spurs of the NBA. The power forward/center is a four-time NBA champion, a three-time NBA Finals Most Valuable Player, and the current captain of the Spurs. He has also won the NBA Rookie of the Year, NBA Most Valuable Player Award twice, and has been voted into 13 NBA All-Star Games, 13 All-NBA Teams, and 13 All-Defensive Teams. ~ Wikipedia.